New Rules Put Brakes On Truck Drivers' Schedules Department of Transportation statistics show that between 3,000 and 4,000 people die annually in large truck and bus crashes in America. Starting July 1, new regulations limiting the hours commercial vehicle drivers can be on the road will be enforced. Between 3,000 and 4,000 people die each year in large truck and bus crashes. New rules that go into effect Monday aim to reduce those numbers. Between 3,000 and 4,000 people die in large truck and bus crashes every year in America, according to the Department of Transportation, which also says 13 percent of those deaths were caused by fatigued drivers. 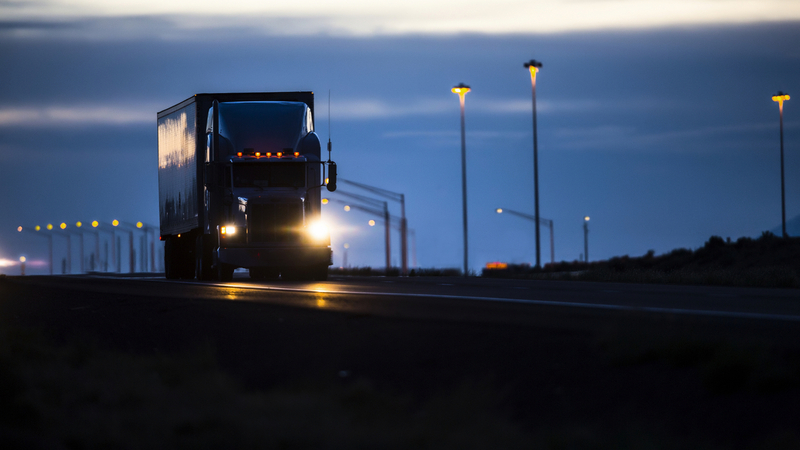 "At the core of that rule is a tremendous amount of research about how fatigue contributes to our ability to be alert and how chronic fatigue undermines and operator's ability to run safely," says Anne Ferro, who heads the FMCSA. At a truck stop near Interstate 95 in Maryland, truck driver Janessa Mann says those tired drivers are a real danger. "The big accidents that happen [are] because the driver was up for 36 hours straight," she says. "Your brain can't handle that." But many drivers say the 30-minute break stipulated by the new rules while reasonable, is unnecessary. "Bottom line is, anybody that's been [driving] for a while or has a good head on their shoulders is going to know when they're gonna need to stop," says driver Troy Wittmer, on his way from New Jersey to Georgia. The rules will only affect about 15 percent of truckers — those running the longest routes. Ferro says the changes could save as many as 19 lives per year, but she acknowledges there is a financial toll. "Drivers are paid by the mile or by the load," she says, "so it really is the case, the longer you sit, the more money you make." FMCSA estimates put the cost to the trucking industry at half a billion dollars. But Ferro says that increases in safety and improved driver health will mean a net economic gain of $200 million. For truckers such as Mann, the realities of the road often leave drivers without a good option. "Truckers are always gonna push it, because we don't have a choice," she says. "The stuff needs to be there. If you don't make it on time, the companies will make you sit in their parking lot for two to eight hours because you were late." Ferro says she agrees pressure from companies can be a problem. "The shipping and receiving industries, the customers of those trucking companies, also have an obligation to understand their role in the supply chain and the impact of their decisions on safety," she says. And in fact, it is illegal for a trucking company to push a driver past the legal limits. Truckers have traditionally kept track of their hours in paper log books. But those hours are harder to verify and have been known to be falsified both by truckers and by their employers. A new generation of automated electronic logs — linked directly to a truck's engine — are being phased in across the industry. Driver Gary Hewood, on the road to North Carolina, says that in the end it's a question of personal responsibility. "It's up to the driver whether he's gonna make his money or get his rest," Hewood says. "And if he's got any sense in him, he'll make money and get his rest."